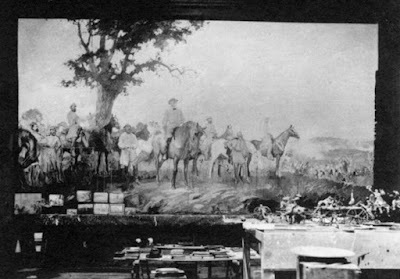 Charles Hoffbauer (1875-1957) painted a series of murals about the Civil War known as the Memorial Military Murals. They're in Richmond, Virginia, and they have recently been restored. 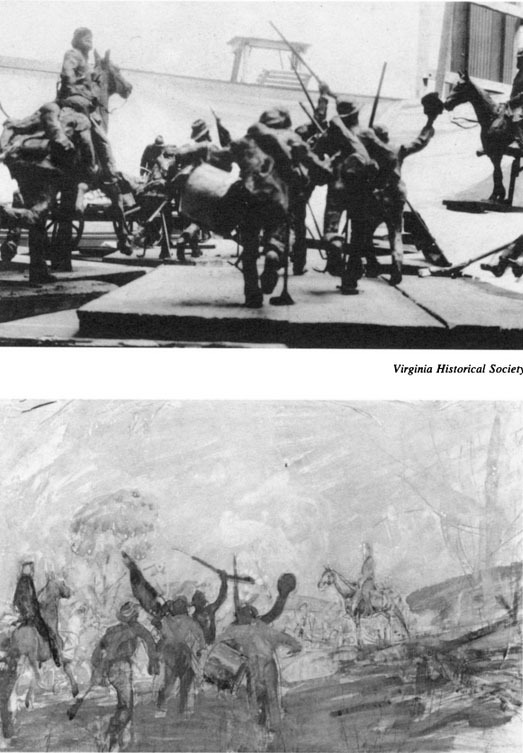 The Virginia Historical Society owns the sketches that Hoffbauer did in preparation for painting the murals. He had studied at the École des Beaux-Arts in Paris, and followed a fairly typical method of the time. He began by studying whatever photographs and accounts he could find of the battles, and he produced thousands of sketches. 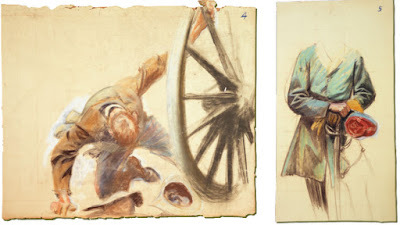 Here are some of his quick sketches of a drummer boy to get just the right action. 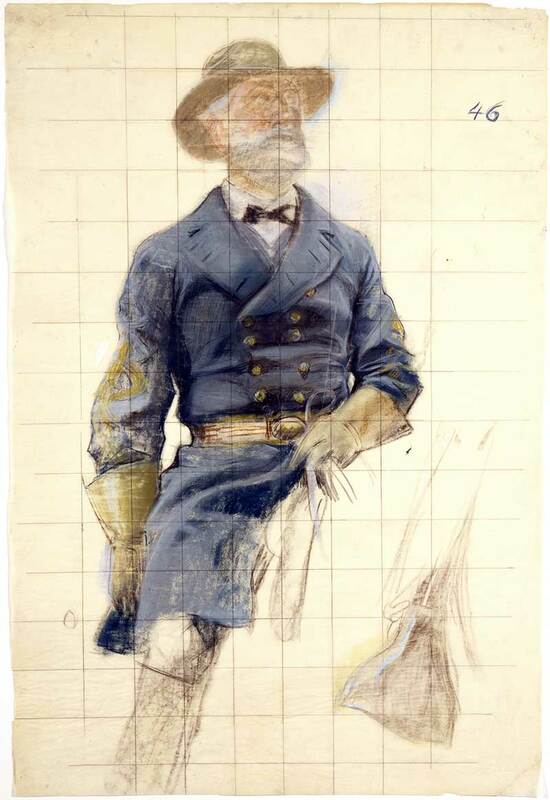 Here is one of his studies from a costumed model standing in for Robert E. Lee, with a grid drawn over the study to allow it to be transferred to the canvas. Hoffbauer produced the murals between 1913 and 1921. He would have been familiar with the sculptures of Rodin and Remington, and the maquettes of Meissonier. 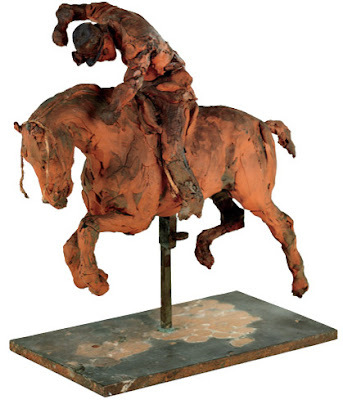 Hoffbauer's clay reference maquettes have a vitality all their own. The maquettes helped him with perspective and staging. You can see a grouping of maquettes in the right foreground of this photo. 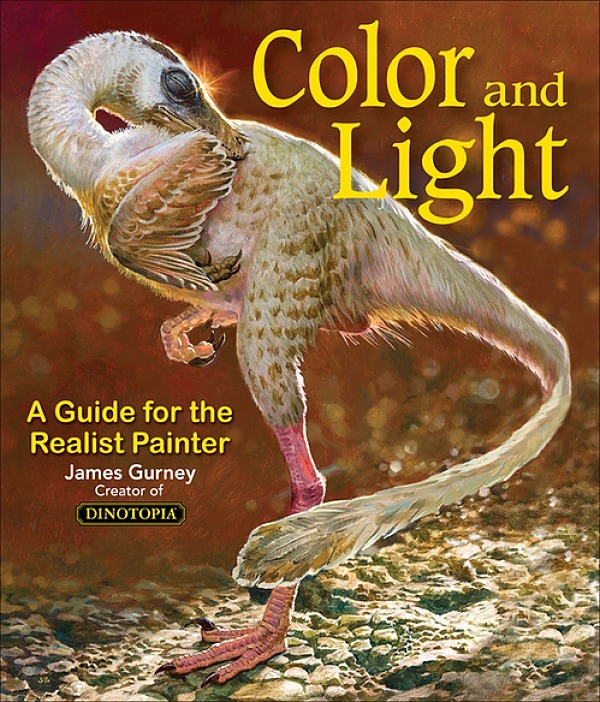 Leaned up against the painting are some of the small color sketches he referred to. The low table in the middle contains other sketches, which number in the thousands. Sometimes the maquettes were pretty elaborate, but it was a great way to work out the groupings and silhouettes. 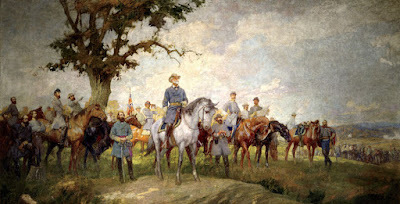 Hoffbauer didn't end up using this composition at all because it shows the backs of the Confederates, and he feared it would be perceived as a portrayal of retreat. Article in Virginia Magazine of History and Biography, "Making the Confederate Murals"
Doing all these preliminary studies and maquettes reminds me of how you often approach a painting. I also like the tree in the main painting. Thanks for posting. Cool! 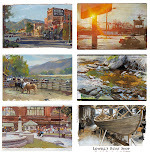 We live up the street from the Historical Society. I'll have to take my son. 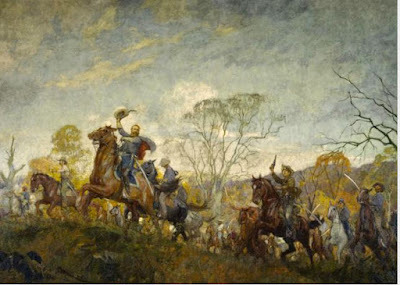 We pass it frequently on the way to the VA Museum of Fine Arts, which is next door to it. I too live very close, about 3 blocks from the VHS and have been eagerly awaiting the re-opening after many months of rebuilding and refurbishment. It really is a great museum and is highly recommended.